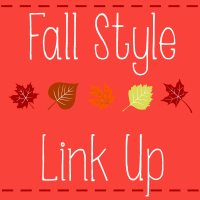 Coming Soon: The Fall Style Link Up! I am excited to announce that my Fall Style link up will begin next week! Fall Style will take place every Thursday throughout the fall, starting September 4th and going through the end of November! This link up is open to all bloggers, you do not have to be a “fashion” blogger to participate, because we can all have great fall style! You can show off your fall outfit of the week or even create a collage of fall clothing you like if you didn’t take outfit pics that week! The early weeks of September are great for showing off some transition pieces that you like to wear from summer to fall, or going through you closet to pick out some cute fall outfits! As a bonus I will also be pinning some of my favorites from the hop to my Fall Style pinterest board! I can’t wait to see everyone’s Fall Style and I hope you’ll join me this fall for this fun hop! And, if you’re interested in co-hosting please let me know! If you plan to link up, or you just want to help, please take a button to help spread the word! To help promote this I am also giving away a $10 Target giftcard over on my instagram! Check out this photo for all the details on how to enter! Can’t wait for September 4th and want more fashion now? Check out my fashion boards on pinterest! What fall styles are you most looking forward to this year? Yay! I'm excited! I will certainly be linking up! Can't wait for the link up!! Boots! I love my boots! I'm actually hoping to find the perfect pair of boots this year, and a bunch more scarves to accessorize 🙂 Love the idea, Rachel!